Diesel left everything behind for his son's saftey. Rory is on the run from a hellish life. Both fight the attraction, both have trust issues. When a secret sends her away into the hands of her deranged brother she knows they both with his clubs help must fight to save a little boy and her from Rory's brother. Can't wait for the next book. Wow oh wow, Diesel completely knocked my socks off. Again Jordan Marie has delivered an unmistakable page turner that will satisfy your craving for more of the Savage Brothers MC. 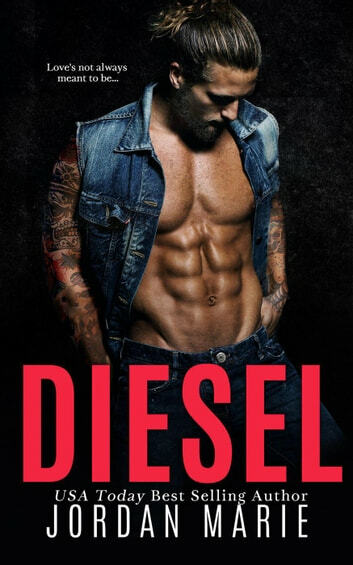 Diesel, holy hotness in a man bun! Having been burned in the past by women, Diesel is closing himself off from the world, all he wants to do is protect his son, Ryan is his priority. Diesel has made major changes and sacrifices in his life to keep his son safe. Rory is infatuated with her new neighbour. The tall, built beautiful man with long dirty blonde hair intrudes on her nightly and this just infuriates her all the more. He doesn't know her so how dare he speak to her so rudely when all she was doing was introducing herself to him and his son, and the fact that he invades her thoughts is driving her mad. All kinds of a-hole! She left behind plenty of those she is not looking to get involved with another. Diesel believes he must segregate his son from all women, he doesn't trust any of them, his suspicions come from deep rooted hurt and betrayal in his past. It is unfair the way he treats Rory but he cannot help his reaction. The red haired neighbour and her freckles are working under his skin, she doesn't react how he would expect to his attitude which intrigues him especially when her learns how thin his walls are lol. These two severely butted heads in the beginning. Diesel's opinion of women based on his past was a huge mountain for Rory to climb, and she refuses to be treated like she is less than nothing, she has felt like that her whole life and is saying no more. It is no wonder these two have a intensely strong attraction to one another. The event that unfold in this story had my jaw hitting the floor. The suspense just built and built until it just exploded in an epic climax that left me shocked and screaming for the book not to be finished . To say that December cannot get her fast enough is an understatement! Part one of the Love/War Duet is not to be missed! Love love love Rory and Diesel. Diesel has been betrayed by so many he finds it hard to let someone in. Rory has also had a rollercoaster of a life and is constantly fighting against her emotions. The ups and downs, this whole story is amazing! It is a cliff hanger, but you're definitely warned more than enough that it will be, and it's so worth reading and having to wait for what comes next!